Rural Vanuatu is still quite undeveloped so, in general, you are not going to find electricity, hot showers, telephones, western food and five star services; the standard varies considerably. Some places are remote or new and not experienced in dealing with tourists. Other places are resort-like. Transport can sometimes be inconvenient and expensive to the outer islands. These small challenges will not deter confident travellers. We encourage visitors to extend their travel into the outer islands simply because this is the only way you will find a unique and real experience away from the commercial tourism centres of Port Vila and Luganville. When you stay in island bungalows and guesthouses you are making a much valued contribution to the rural economies of Vanuatu . The number one rule in Vanuatu is not too worry - you are on vacation. The second rule is to leave some degree of flexibility in your travel plans - you can't plan for everything and you don't know what you might discover. You will soon find out about 'island time'. Vanuatu is not an overpopulated, urbanised, industrialised, polluted, climate changing state like the so called 'developed' world. Things happen on their own time in Vanuatu . Only a couple of bungalows can be booked and paid from overseas travel agents. Many don't even have a proper reservation system in place, a bank account or a booking agent. But don’t worry, there are very few people visiting the outer islands and you don’t need to be too concerned about bookings. This travel media guide book will pave way for you to make your travel into our islands much easier and smooth. Bungalow owners rarely think of advising anyone about changes to their business, this is a problem we know too well. The bungalow may be closed, there could have been a cyclone and it has been destroyed, or prices have gone up. But don’t worry, you will soon explore all the contacts you will need for your outer island travel, this will help ease the stress — don't plan too much, it will only bring you stress. Form a rough outline of where you want to go, allow plenty of time, and sort out the details as you go. The Vanuatu Island Bungalows and guesthouse tourist accommodations in rural Vanuatu are usually locally owned and run by Ni-Vanuatu. 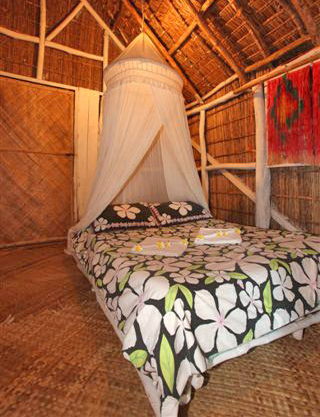 The bungalows offer basic accommodation, meals and assistance to adventure travellers. When you stay in island bungalows and guesthouses you are making a much valued contribution to the rural economy of Vanuatu . Some parts of rural Vanuatu is still quite undeveloped so, in general, you are not going to find electricity, hot showers, western food and five star services. Do not expect luxury items or features except a clean bed and a friendly host. Some business owners are also new to business and are not experienced in dealing with tourists so please be patient. We encourage visitors to extend their travel beyond the main centres into the outer islands simply because this is the only way you will find a unique and real experience away from the commercial tourism centres. You will not need to plan too much – pack a few clothes, camera and a small amount of cash for outer island excursions. The number one rule in Vanuatu is not too worry - you are on holiday. You will find out about 'island time' where things happen in their own time, so leave some degree of flexibility in your travel plans so that you have time to relax and enjoy the real culture of Ni-Vanuatu – you just never know what you might discover. Form a rough outline of where you want to go, allow plenty of time, and sort out the details as you go. Bungalows are simple & clean.